SportLogic can help you to manage your coach’s/ teacher’s wages according to their lesson schedules and pay-rates. You can generate an activity pay rate report to assist you in the business’ payroll task. The report will also detail the coaches’ attendance in the class sessions and private lessons, effectively providing a helpful timesheet. The wages report will show both the “scheduled” hours as well as the “attended” hours. Scheduled hours reflect the lessons assigned to the coach whereas the Attended hours reflect the coach attendance status. To accurately work out the wages, it is always best to look at the Attended hours. Private lessons (booked directly on the booking calendar) works the same way too. If you mark it as attended then it will show up on the attended hours. Again, coaches can mark their attendance from the mobile app or from inTennis. From the top menu bar, select Coaches -> Manage Wages. Perform a search on all the activities for a coach in a given date range (up to 31 days). A list of all the coach’s activities according to the date range selected will be shown as below. Now you can assign a pay rate to each of the activities. You could either bulk assign the pay rate manually, or do an auto-fill. 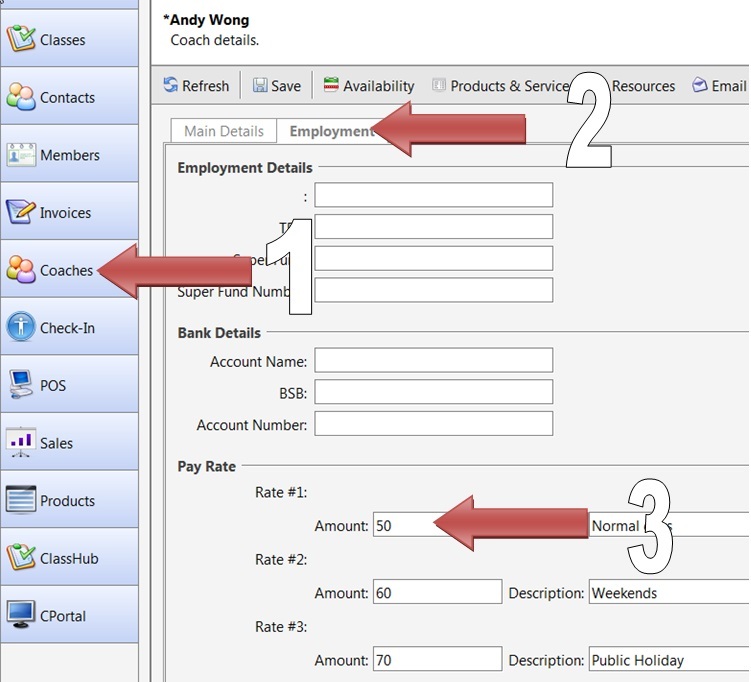 Auto-fill allows the system to auto assign a pay-rate to an activity according to the to pay information defined in the activity’s class. A window will be displayed allowing you to select the pay rate for activities. Click on the Autofill button. This will auto-fill all the pay rates on this page according to the configured class’s pay rate information. If no class rate is defined in the classes, no pay-rate will be assigned. You will need to assign them manually. Finally, click on Export Report and select all activities. The report generated would be similar to the one shown below. You can export only the ATTENDED activities (i.e. a class with coach’s attendance marked, or private lesson booking with status “ATTENDED”). This is helpful if you only need to pay for attended lessons. Accounting payroll functions such as super/leave loading etc are not taken into account. The “Manage Wage” function is designed to assist wage calculation based on coaches’ activities defined in the system. It is not a payroll system. First, you would need to define each coach’s pay rates. To do this, the user will need to have the user permission “Manage Pay Rate”. Click on Coaches, select to open a coach’s detail. If you want to take advantage of the “auto-fill” function to calculate the pay, you will need to define the pay rate in each class. From the menu, Select Other and then on Select Pay Rates. 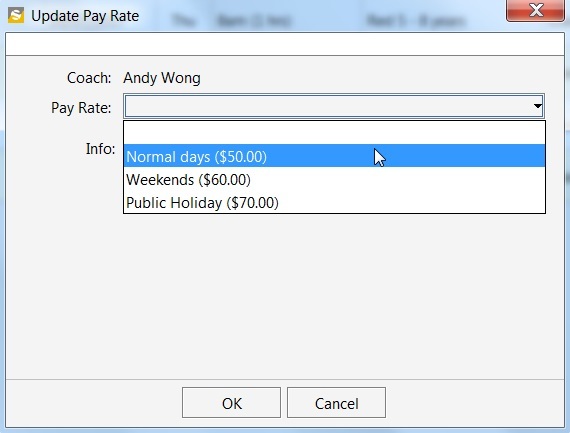 A window will be displayed to allow you to enter the pay rate for the class coaches/teachers. 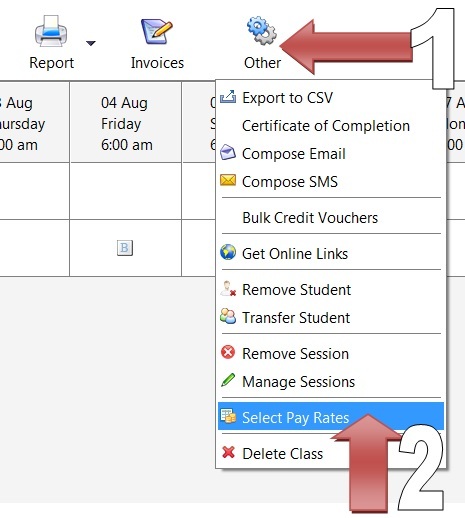 This defined pay rate will be used when the auto-fill function is used to assign the pay rate.